The Chinook Pass Scenic Byway runs from the rolling fields of Enumclaw west of the Cascades to the Naches Valley east of the range. Along the way, this two-lane pass wraps around the northeastern flank of iconic Mount Rainier. 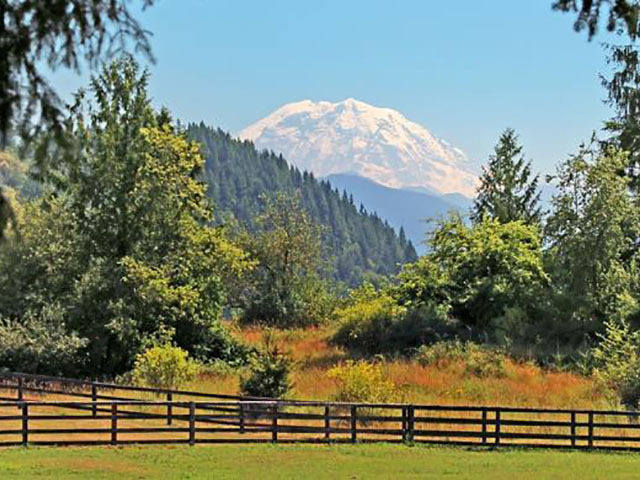 Driving along this byway will give you a first-hand answer to that ubiquitous Washington State question, “Is the Mountain out?” But picture-perfect glimpses of the tallest peak in the continental United States aren’t all this route has to offer. This is a “boots-on” byway that presents every opportunity to step out of the car into dense forests, alongside rollicking rivers and onto high desert plains. It seems there is a new microclimate every other mile, so bring along extra layers of clothes, a solid pair of shoes, and don’t forget your camera. At the start of the byway, 14,410-foot-tall Mount Rainier steals the scene and challenges the sky. Pause in Rainier’s foothills to explore an old-growth forest or snowshoe a placid path. As you travel east, rushing water seems your constant companion, as this road follows routes carved by the White, Greenwater, American and Naches rivers long ago. Finally, the dense Douglas fir forests of the western Cascades will give way to the sparser tamaracks and ponderosa pines of eastern Washington’s foothills. At the byway’s end there are many rewards; miles of horizon, abundant wildlife, farm stands filled with local produce and, usually, warm weather and blue eastern Washington skies. Before you jump in your car and head out, remember a portion of this route is a seasonally restricted road—plan your trip between late May and late November. CLICK TO EXPLORE ON MAP to find more things to do, places to stay and eat along this route. The Gateway to Mt. 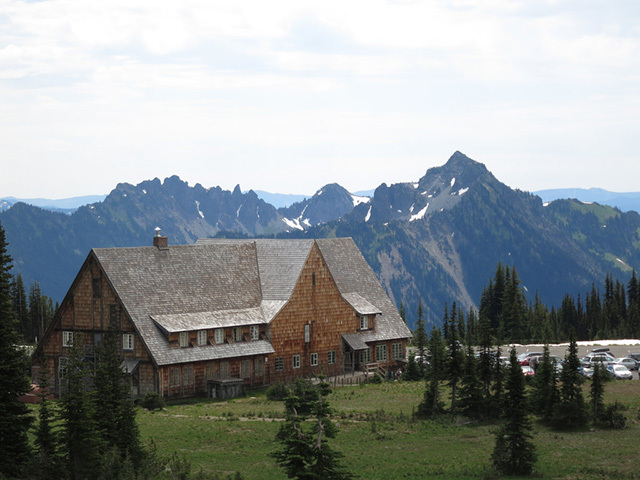 Rainier National Park, Enumclaw anchors the west end of the Chinook Pass Scenic Byway. The King County Fairgrounds hosts year-round events and the downtown features several locally owned shops and diners. The little town of Greenwater was a stop on the historic Naches Trail where the earliest settlers arrived here in wagons. Many years later, the first visitors to newly opened Mount Rainier National Park drove that same route. 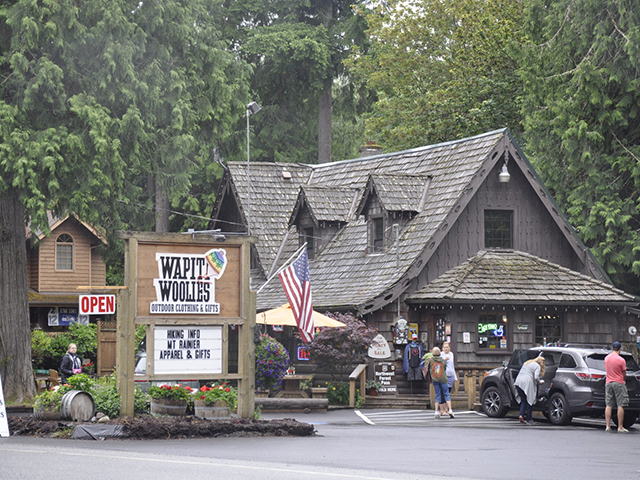 Don’t make the mistake of speeding past this forested town; Greenwater is the perfect spot to stop, stretch your legs and grab coffee. 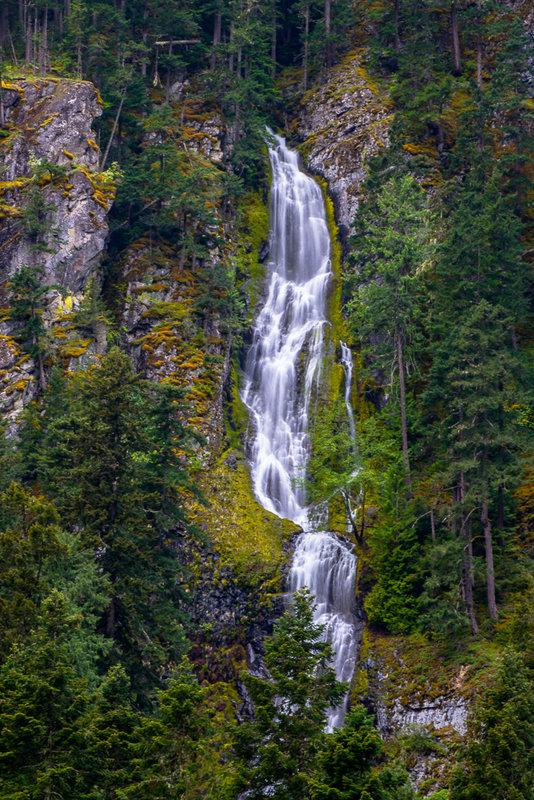 A few miles up the road from Greenwater, look for the signed viewpoint for Skookum Falls, a cascading in a pair of narrow tiers and dropping 250 feet which is visible from US-410 along the west side of the White River. Spring runoff season is the best time to catch the falls, and there is a parking area for viewing. The Chinook Pass Scenic Byway traverses the northeast corner of Mount Rainier National Park, a true Washington wonderland. Just 15 miles off the byway, via the White River entrance (a $15 fee per car is required), is the scenic drive to the park’s Sunrise Visitor Center, the mountain’s highest elevation (6,400 feet) accessible by car. During winter, Washington’s largest ski resort, Crystal Mountain, has 2,600 acres of world-class terrain for skiers and snowboarders, along with many slope-side lodging and dining options. 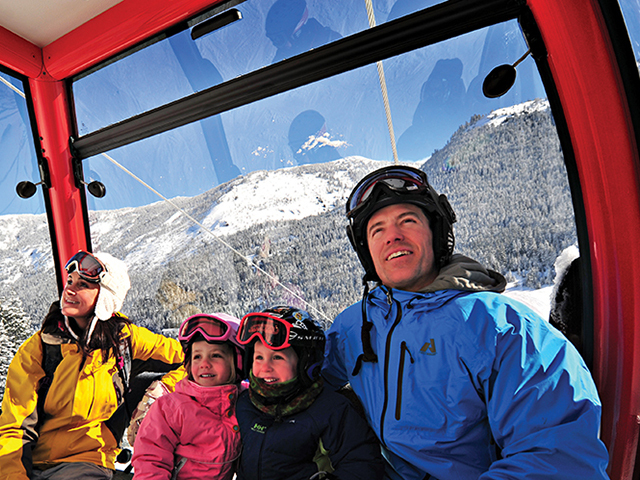 A new high-speed gondola allows skiers to make even more runs on those perfect powder days. About 8 miles past the entrance to Sunrise, the byway winds upward along a series of switchbacks to another popular stop and photo-op—Tipsoo Lake. Chances are you have seen this lake, with Mount Rainier reflected in its still waters, even if you’ve never visited. It’s one of the most photographed nature scenes in the United States. Spelunkers should turn onto a road marked “Boulder Cave National Recreation Trail” (a popular birding trail). 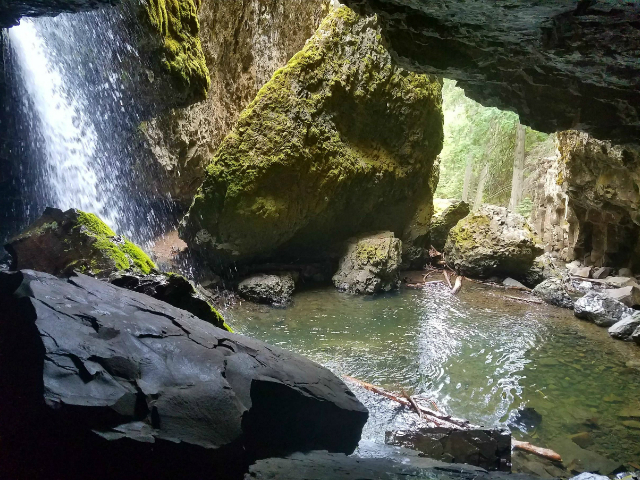 A bridge over the Naches River leads to a mile-long walk to Boulder Cave, a 400-foot-deep cave where a dwindling population of Townsend’s big-eared bats hibernates during the winter (the cave is closed to the public at that time). Cliffdell, a quiet area in the woods of Wenatchee National Forest, is a good place for travelers to pick up supplies, grab a great meal or even book a room after the scenic drive over the pass. 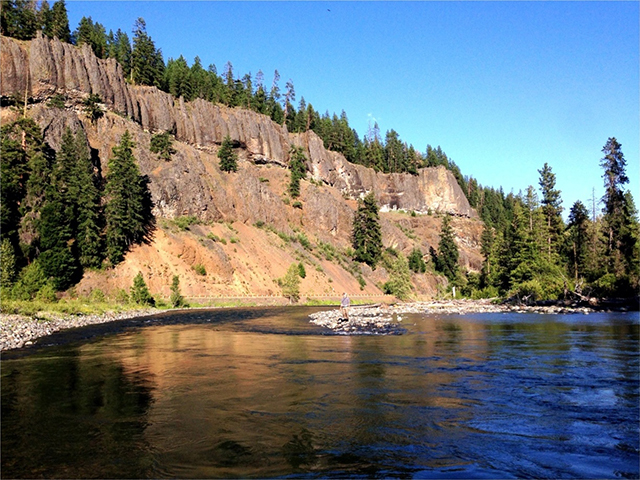 The byway’s end point, Naches, is a tiny community 13 miles northwest of Yakima near the banks of the Naches River. 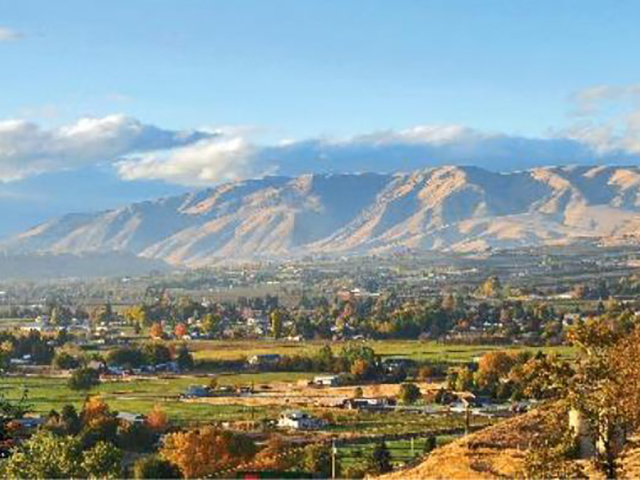 The town is a gateway between the wild forests of the Cascades and the fruit orchards of the Yakima Valley. The portion you see from the highway does not tell the full story of this small farm community; pull off the road to cruise the downtown core to get a better picture.